Barn Charm – Thanks, MJ! Some of you are already familiar with the blog, Emjay and Them. If you aren’t, you should definitely pay her a visit. MJ and I became followers of each other’s blogs after I had the honor of being Freshly Pressed a couple of years ago. I can count on MJ’s posts to be witty, encouraging and thoughtful. And she’s one of my most faithful readers. Recently, MJ was sweet enough to send me a picture of her Grandpa’s barn, tell me a little about it (and him) and allow me to share it on Barn Charm. MJ’s Grandpa’s name was Ausser Forsberg. He was born in Steven, Minnesota and was the 6th of 10 children. In 1906, the family immigrated to Saskatchewan, Canada, due to his mother’s severe allergies. The family lived in a tent until the house was built. In 1923, Grandpa Ausser married Pearl. MJ shares that it’s said Pearl turned down many marriage offers before accepting Ausser’s. They raised five children, and their children, grandchildren and great grandchildren still live on the land and in the area. 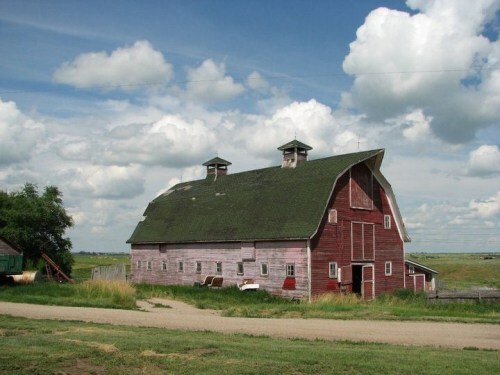 In MJ’s words: “My Grandpa’s barn: home to Belgians and Herefords, alley cats, bats and puppy dogs; home to the lazy days that housed this prairie girl’s childhood”. It’s obvious that MJ has many sweet memories of this beautiful old barn, and I’m honored to share it this week for Barn Charm.